Is the radiocarbon clock still set properly? Entire scientific worldviews count on its reliability. Research scientists determine the age of carbon-based materials such as bones, wood, ceramics, textiles and iron using the radiocarbon method. But man-made CO² emissions could weaken the informative value of the method. Is the mummy really the daughter of the Persian King Xerxes I? Was the Shroud of Turin a fake? When did the Neanderthals become extinct? The answers to these questions have been provided by one of the most important procedures for age determination in archaeology, art history and criminology - radiocarbon dating, also referred to as carbon-14 dating. With this method scientists are able to read a kind of clock that runs in all organic materials. The radioactive isotope carbon-14 is continuously being created by cosmic radiation in the upper atmosphere. Out of approximately one billion "normal" stable carbon atoms (carbon-12), one radioactive carbon-14 atom emerges. Both isotopes oxidise immediately into carbon-dioxide CO². This is then absorbed by plants and, through the food chain, the carbon also arrives in all other life forms. In the course of this process, the ratio of carbon-14 to carbon-12 remains about the same as in the atmosphere - until the organisms die. At this point they no longer absorb new carbon, i.e. no more carbon-14. The radioactive carbon-14 that is already there decays with a half-life of 5,730 years; in a certain sense an hourglass then begins to operate. On the basis of the remaining quantity of carbon-14 (more precisely - the ratio of carbon-14 to carbon-12) in a material sample, its age can thus be calculated. After nine half-lives, i.e. after about 50,000 years, there is no longer enough radioactive carbon remaining that can be measured. In other words, the carbon-14 clock has ceased to function. Who has been re-setting the clock? To the disappointment of researchers, the quantity of carbon-14 in the atmosphere fluctuates over the course of time. Changes in the Earth's magnetic fields and the sun's activity influence how many new carbon-14 atoms emerge in the atmosphere. Accordingly, the "hourglass" that begins to operate once an organism has died is not always equally filled at the starting point. Such fluctuations lead to inaccuracies or conflicting test results from a sample. For the coming 85 years, a new study written by Heather Graven, physicist at Imperial College London, predicts a pronounced reduction in carbon-14 concentrations in the atmosphere. Graven calculated her carbon-14 forecasts on the basis of various world-climate scenarios for future CO² emissions. This is because the carbon in the CO² that is blown into the air whenever oil, coal and natural gas are burned is millions of years old - all of the carbon-14 found therein has decayed in the mean time. This "old" carbon rarefies (dilutes) the carbon-14 in the atmosphere. Organisms that absorb the carbon from such an "old" atmosphere contain less carbon-14 and are thus estimated to be older than they really are - when the radiocarbon method is used. Their "internal hourglass" is insufficiently filled up, so to speak, from the beginning. Will this prove to be the downfall of the radiocarbon method, as popular media are beginning to headline? Ronny Friedrich, Director of the laboratory at the Klaus Tschira Archäometrie Zentrum at the University of Heidelberg, qualifies this: "Carbon-14 dating will, of course, continue to be a relevant method. That fossil emission alters carbon-14 concentrations in the atmosphere is nothing new - and there have been fluctuations in the past as well. The novel aspect of Graven's study is that we now have an idea of the future dimension of the alteration depending on the emission scenario - and of its effects upon the measurements." For the accuracy of radiocarbon dating, it is thus crucial to assess carbon-14 fluctuations in the atmosphere as thoroughly as possible. "We correct the measured carbon-14 values on the basis of calibration curves that are being continuously improved", explains Wolfgang Kretschmer, Director of the carbon-14 laboratory at the Universität Erlangen-Nürnberg. These curves are based on carbon-14 content from sediment layers in old lakes and tree rings, whose absolute age is known and can account for thousands or even tens of thousands of years. Heather Graven's prediction for the next 35 years is: If human beings do not reduce their CO² emissions, fresh organic material in the year 2050 will contain as little carbon-14 as the old material from the year 1000 A.D. Utilising only the carbon-14 method, in the year 2050 it will not be possible to differentiate a new, falsified silk scarf from a silk scarf from the era of Queen Editha (910-946), the wife of Otto the Great. However, most samples that are to be carbon dated have an archaeological context. They are typically found in specific excavation strata or together with other artefacts. Works of arts can frequently be historically classified, can be chemically analysed, or have their own provenance. But a worst-case-scenario still remains, admits Ronny Friedrich: "It becomes problematic when scientists have no context to the samples. Ambiguities will then emerge with carbon dating in investigations of authenticity and criminological cases". 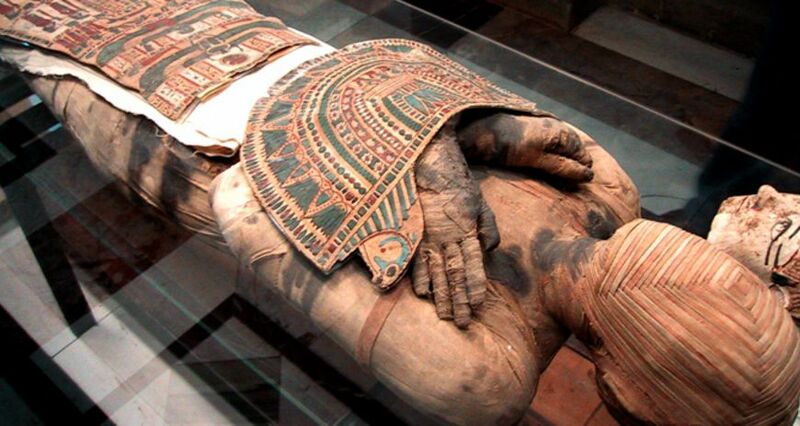 How science can solve an ambiguous carbon dating sample even without information concerning its context is reported here by Wolfgang Kretschmer: In Pakistan in October 2000, allegedly, the first Persian mummy was discovered. The inscription on the double sarcophagus identified the corpse, adorned with a facial mask and a breastplate made of gold, as that of the daughter of the Great King Xerxes (5th century B.C.). Anomalies in the embalming technique and the Old Persian cuneiform script were confusing - the initial carbon-14 datings revealed that the date of death for the reputed princess was either around 1958 or around 1992. Both age determinations exposed the art work as an elaborate forgery. Kretschmer's team were able to ascertain the precise time of death, because various bodily tissues transform carbon at different rates. A comparison of the carbon-14 content in the bone collagen with that of the skin revealed: The 20- to 40-year-old woman died between 1994 and 1996! An archaeological sensation was thus turned into a criminal case.